Gorkhi-Terelj National Park (Mongolian: Горхи-Тэрэлж [ɡɔrxi tɛrɛɮʃ], creek-rhododendron) is one of the national parks of Mongolia. The Terelj tourist zone has a number of "tourist camps" (Mongolian: жуулчны бааз, juulchny baaz). It is connected with Ulaanbaatar by a paved road (main road to the East #A0501 Baganuur-Öndörkhaan direction, 37 km from Ulaanbaatar city center, left turn to the branch #A24, 5 km later road crosses Tuul River and the National park territory begins). The road comes to the Gorkhiin Davaa (Mongolian: Горхийн даваа) pass. Most of the tourist camps and tourist attractions are before this pass. The road then ends at the settlement of Terelj, which features small shops and restaurants. The Terelj settlement is located in the valley of the Terelj River (Terelj Gol), approximately 66 km from the Ulaanbaatar city center. The national park tourist zone is formally in Nalaikh düüreg (district) part of Ulaanbaatar municipality, the rest of the protected zone beginning to the north of the Terelj River, is located in Mongolia's Töv Province (Töv aimag). A small southern portion of the park is developed for tourists, with restaurants, souvenir shops, horses and camels for rent, and tourist ger camps, many of them run by the Juulchin corporation, the former state tourism company. However, most of the park is undeveloped and difficult to access. Attractions include Khagiin Khar Lake, a 20m deep glacial lake 80 km upstream from the tourist camps, and Yestii Hot Water Springs, natural hot springs 18 km further upstream. The park also has a Buddhist monastery that is open to visitors. Park wildlife includes brown bears and over 250 species of birds. The Tuul River flows through the park. The park has many rock formations for rock climbers, and includes two famous formations named for things they resemble: Turtle Rock (Mongolian: Melkhii Khad) and the Old Man Reading a Book (Praying Lama Rock). Many Westerners were introduced to Gorkhi-Terelj National Park when the CBS reality television program The Amazing Race visited the park in the second episode of its tenth season. Wikimedia Commons has media related to Gorkhi-Terelj National Park. Wikivoyage has a travel guide for Gorkhi-Terelj National Park. This Mongolia location article is a stub. You can help Wikipedia by expanding it. This article related to a protected area in Asia is a stub. You can help Wikipedia by expanding it. The transportation system in Mongolia consists of a network of railways, roads, waterways, and airports. Ulaanbaatar, formerly anglicised as Ulan Bator, is the capital and largest city of Mongolia. The city is not part of any aimag (province), and its population as of 2014 was over 1.3 million, almost half of the country's total population. Located in north central Mongolia, the municipality lies at an elevation of about 1,300 meters (4,300 ft) in a valley on the Tuul River. It is the country's cultural, industrial and financial heart, the centre of Mongolia's road network and connected by rail to both the Trans-Siberian Railway in Russia and the Chinese railway system. Mount Augustus National Park is located 852 km north of Perth, 490 km by road east of Carnarvon and 390 km northwest of Meekatharra, in the Gascoyne region of Western Australia. Mount Augustus itself, the feature around which the national park is based, is known as Burringurrah to the local Wadjari Aboriginal people. The Low Tatras or Low Tatra is a mountain range of the Inner Western Carpathians in central Slovakia. Khovd is one of the 21 aimags (provinces) of Mongolia, located in the west of the country. Its capital is also named Khovd. Khövsgöl is the northernmost of the 21 aimags (provinces) of Mongolia. The name is derived from Lake Khövsgöl. Töw is one of the 21 aimags (provinces) of Mongolia. The national capital Ulaanbaatar is located roughly at its center, but the city itself is administrated as an independent municipality. Erdenet is the second-largest city in Mongolia and the capital of the aimag (province) of Orkhon. Officially known as Bayan-Öndör sum. Located in the northern part of the country, it lies in a valley between the Selenge and Orkhon rivers about 150 miles northwest of Ulaanbaatar, the capital. The road length between Ulaanbaatar and Erdenet is about 230 mi (370 km). Delnice is a town in western Croatia, the largest settlement in the mountainous region of Gorski Kotar, in the Primorje-Gorski Kotar County. The town has a population of 4,379, and total municipality population is 5,952 (2011). Delnice is Gorski Kotar's main town. The Cumbres de Majalca National Park is a national park in the Mexican state of Chihuahua located 88 km northwest of the city of Chihuahua. The park showcases extraordinary rock formations that have been shaped by wind and water erosion. The park was created by presidential decree in 1939 encompassing 4,772 hectares to protect the endemic flora and fauna. The park is characterized by pine and oak forest. The park is one of the few areas in Mexico that are inhabited by black bear. Magnetawan is a township in the Almaguin Highlands region of the Parry Sound District in the Canadian province of Ontario, as well as the name of the primary population centre in the township. The Tuul River or Tula River is a river in central and northern Mongolia. Sacred to the Mongols, the Tuul is generally called the Khatan (Queen) Tuul in Mongolian. It is 704 kilometres or 437 miles long and drains an area of 49,840 square kilometres or 19,240 square miles. The river is called the "Duluo river" in the Book of Sui, a Chinese historical work completed in 636 AD. The Secret History of the Mongols frequently mentions a "Black Forest of the Tuul River" where the palace of Wang Khan was located. 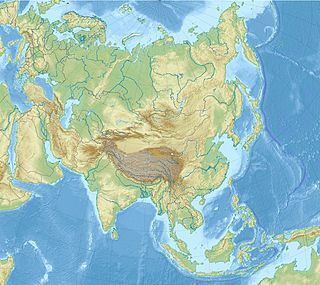 The Ming dynasty (1368–1644) was established by the progressive expulsion of the Mongol Empire from China. After capturing Beijing, the Ming's founding Hongwu Emperor defeated the Mongols at the Tula River in 1372, driving them back to the Orhon River. The following Hongwu Emperor would find it necessary to defeat the Oirats at the river Tula again in 1414. 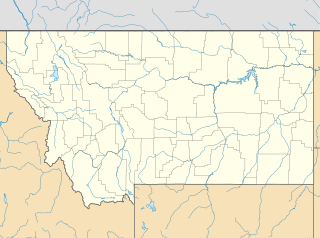 Babb is a small unincorporated farming and ranching community in Glacier County, Montana, United States, on the Blackfeet Indian Reservation. The community experiences a large influx of tourist in the summer months as it is the gateway to the Many Glacier area of Glacier National Park. Babb is a census-designated place (CDP) and had a population of 174 at the 2010 census. Hotel Mongolia is a hotel in the form of a mock castle near Gachuurt village, in the Bayanzürkh district of Ulaanbaatar, Mongolia. It claims to be the only resort hotel in the country. Khustain Nuruu National Park, located in Töv Province (Aimag), is a national park of Mongolia. It is also known as Hustai National Park. The Tuul River runs through the park. The Genghis Khan Equestrian Statue, part of the Genghis Khan Statue Complex is a 131-foot (40 m) tall statue of Genghis Khan on horseback, on the bank of the Tuul River at Tsonjin Boldog, where according to legend, he found a golden whip. The statue is symbolically pointed east towards his birthplace. It is on top of the Genghis Khan Statue Complex, a visitor centre, itself 10 metres (33 ft) tall, with 36 columns representing the 36 khans from Genghis to Ligdan Khan. It was designed by sculptor D. Erdenebileg and architect J. Enkhjargal and erected in 2008. Ulaanbaatar Hotel is the first ever hotel built in Mongolia, built in 1961. It was founded by Yumjaagiin Tsedenbal and operates now as a stock company. From 1991 the company has restructured as a pioneer Joint Stock Company in Mongolia. Battulga Khaltmaa is a Mongolian politician who has served as the President of Mongolia since 10 July 2017. He served as Member of the State Great Khural from 2004 to 2016 and Minister of Roads, Transportation, Construction and Urban Development from 2008 to 2012. He was the Democratic Party's candidate in the 2017 presidential election, and was elected President with 50.6% in the run-off, the first ever run-off election in modern Mongolian history. Mongolians are sharply divided about his role in the 2019 Mongolian constitutional crisis.